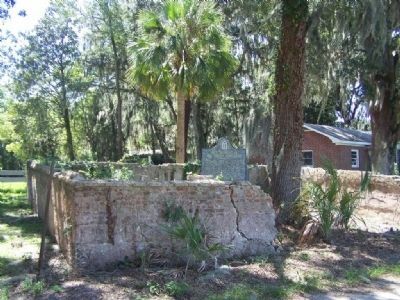 Within these walls are buried Captain Troup, British Naval officer, and his wife, Catherine McIntosh Troup. 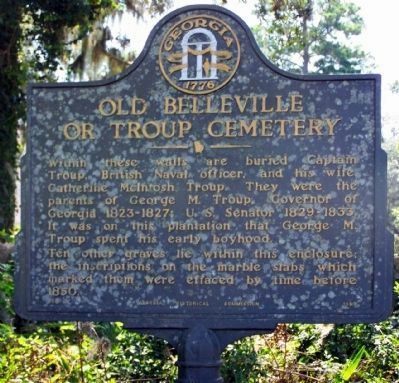 They were the parents of George M. Troup, Governor Georgia 1823-1827; U.S. Senator 1829-1833. It was on this plantation that Georgia M. Troup spent his early boyhood. Ten other graves lie within this enclosure; the inscriptions on the marble slabs which marked them were effaced by time before 1850. Location. 31° 32.102′ N, 81° 21.802′ W. Marker is in Belleview Point, Georgia, in McIntosh County. 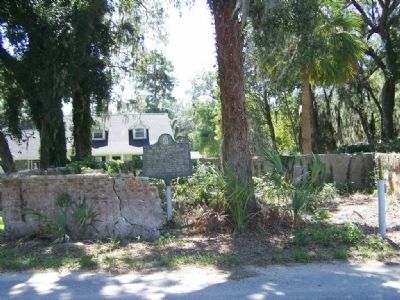 Marker is on Pelican Point Rd near Cedar St, on the right when traveling east. Touch for map. Marker is in this post office area: Crescent GA 31304, United States of America. Touch for directions. (approx. 1.1 miles away); Baisden's Bluff Academy (approx. 1.8 miles away); Sutherland's Bluff (approx. 3 miles away); John Houstoun McIntosh (approx. 3.7 miles away); Rice Hope (approx. 3.7 miles away); Old Court House at Sapelo Bridge (approx. 3.7 miles away). More. 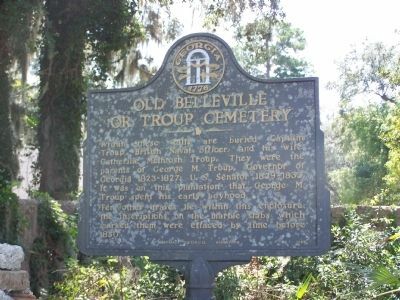 Search the internet for Old Belleville or Troup Cemetery. Credits. This page was last revised on June 16, 2016. This page originally submitted on September 16, 2008, by Mike Stroud of Bluffton, South Carolina. This page has been viewed 1,575 times since then and 7 times this year. Photos: 1. submitted on April 5, 2011, by Mike Stroud of Bluffton, South Carolina. 2, 3, 4. submitted on September 16, 2008, by Mike Stroud of Bluffton, South Carolina. • Bill Pfingsten was the editor who published this page.